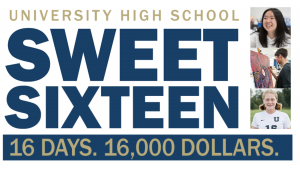 University High School’s annual Sweet Sixteen Challenge began last week, and the goal is to raise $16,000 for The U Fund in 16 days. The challenge ends Friday, March 30. If you have not done so already, please click here to give online. During this challenge, we will periodically share new glimpses into the University High School community, all tied to the number 16. This is the second in that series of posts. While the number 16 is especially celebrated during the Sweet Sixteen Challenge, three University High School student-athletes have a special relationship to the number during their sports seasons. Check out the Q&As with all of our Trailblazer athletes who wear #16. Hallie Harrison is a junior at University High School, and she wears #16 for the girls soccer team. Harrison was a captain of the team this fall, which advanced for the first time to the regional finals. 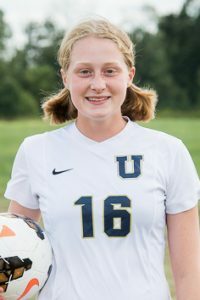 She was named one of the team’s Trailblazer Award winners, Most Outstanding – Defense, PAAC All-Conference, and Academic All-State. What has been your favorite moment while wearing #16? My favorite memory of wearing #16 was during the soccer sectional finals game this season. We were playing Western Boone, who we had previously lost to by two goals earlier in the season. I usually don’t get very nervous for games, but the entire week leading up to the game I was super nervous and the only thing on my mind was this game because I knew we had a chance to win. This was the first time that the school had a chance to win a sectional title for soccer, and both the boys and girls teams were in the sectional finals. The boys played before us, and we all went to watch. They won their game, and seeing them win made our team want to win even more. Our game was later that night and the weather was terrible. We started the game, and both teams scored pretty early in the game. Right before the second half we had to stop the game while we were tied because of lightning. Both teams went to their busses and waited out the storm. They told us that we might have to postpone the game until Monday, and having that thought in my mind made that half hour on the bus one of the longest half hours of my whole life. Everyone else was able to take their mind off the game for a little bit, but I couldn’t. Once the delay was over, we returned to the field and started the game again. We went on to beat Western Boone 3-2 and win the first sectional championship for girls soccer. Being captain of the team and helping lead our team to a sectional title was definitely my favorite memory of soccer. What do you enjoy most about sports at University High School? What I enjoy most about sports at University is that anyone can play and the teams can still be competitive with other schools. Most people think that since University has no-cut sports that all of our sports teams aren’t competitive, and that our sports aren’t taken seriously. This, however, isn’t the case. We have won four sectional titles as a school this year, and there are lots of athletes and coaches who are very committed to the sports they play. I also play basketball, but I would’ve never considered playing basketball if I hadn’t gone to University. Both the head coach and assistant coach asked me to play freshman year, but I was very nervous since I had never picked up a basketball before, and I decided not to play. When they asked again my sophomore year, I decided to play. Now, after two years of basketball, I play on the varsity team and love it. 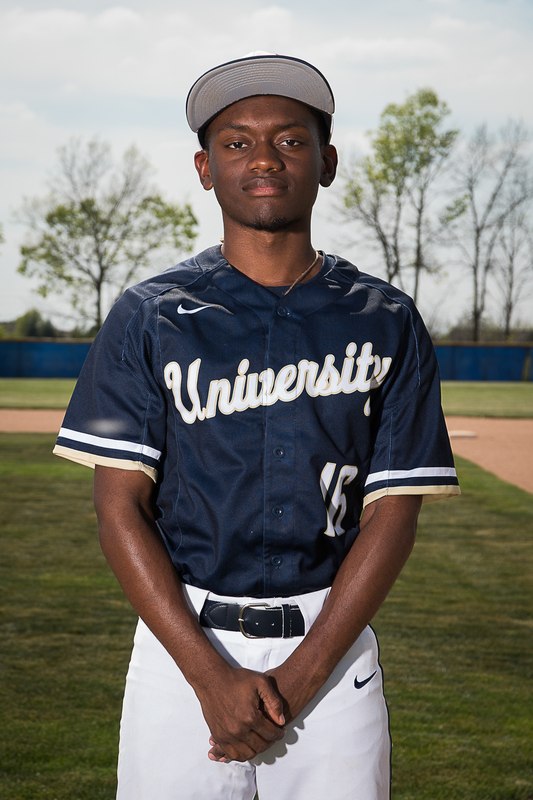 Reggie Mables is a senior at University High School, and he wears #16 for the baseball team. Mables was named Most Improved for the team in the 2017 spring season, and this year’s season kicks off on Thursday, March 22. Why did you choose to wear #16? I actually didn’t choose the number for my uniform. My coaches randomly gave it to me, but when I found out I had the number 16, I was very pleased because Domingo Santana has the same number. My favorite moment while wearing #16 was when I was picked to start on the roster for the game against Tindley. I like that everybody can participate in a sport no matter their skill level. I don’t have the skill level like everyone else on the baseball team because I have only been playing for two years while everyone else has many years under their belts. Although I don’t have the same skill level, I’m still able to have fun on the team. 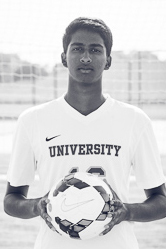 Jay Maturi is a senior at University High School, and he wears #16 for the boys soccer team. Maturi was a captain of the team this fall, which advanced for the first time to the regional finals. He was named the team’s Trailblazer Award winner this season, and he was selected for the PAAC All-Conference team. I wore #16 during both my junior and senior years on the boys soccer team. My favorite experience would definitely be beating Heritage Christian in penalty kicks in the sectional semifinal this year. Especially since we lost 4-0 earlier in the season to them, we knew that we would have to give 100% that entire game. To see us come out on top after everything was an amazing feeling. You could say it was…sweet. The inclusivity. I came in as a freshman, unable to kick a ball 10 feet in a straight direction. I left as a senior captain leading a team to the regional finals. University gave me an opportunity to grow as a teammate and a leader on the field, and I’ve made some of my best friends from soccer.